9/11 Conspiracy News the Mainstream Media Missed. Pouty 9/11 Truthers Get Upset When Reminded to Increase Medications. Two certifiable 9/11 Truthers from We Are Change, Los Angeles, abruptly abandoned their plans to ambush David Frum when Frum reminded them to increase their medications. David Frum is a fellow at The American Enterprise Institute, has written five books, and writes a daily column for National Review. He is credited with coining the phrase, "Axis of Evil," first used by President George W. Bush in his State of The Union address in 2002 to describe Iraq, Iran, and North Korea. David Frum was signing books at the Mark Taper Auditorium in Los Angeles on January 16 when confronted by the Truthers. We Are Change often uses borderline personalities to do unpleasant jobs. Frum correctly assessed the situation, and when one Truther started to confront him, Frum responded, "You should take stronger medication." Frum was using a psychological technique taught at Official NWO Training Camps (ONWOTC) nationwide to disarm the certifiable, paranoid, and politically unstable kooks that flock to fringe political movements like the 9/11 "Truth" Movement. Once reminded to increase their medications, the two "We Are Change" certifiables erupted in anger as predicted. "I know how to increase my meds! ", one yelled. Police escorted the hapless, mumbling Truthers out the door while a third who filmed the incident didn't get that their mission had backfired and posted the video to YouTube instead of destroying it. New Scripps Howard News Service/Ohio University poll shows increase in belief in conspiracy theories caused by mainstream media. A Scripps Howard News Service/Ohio University poll of 811 adult residents of the United States shows nearly two-thirds of Americans think it is possible that some federal officials had specific warnings of the Sept. 11, 2001, terrorist attacks on New York and Washington. Eighty-seven percent of those who harbor such suspicions blame the mainstream media for "brainwashing" them into believing in various conspiracy theories. 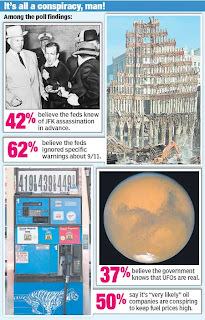 The poll also found that 44% of Americans believe some in the government knew of the Kennedy assassination in advance; and 35% believe the government is hiding the existence of flying saucers from them. An earlier poll showed that 71% of Americans believe television was their best source for news about the 9/11 terrorist attacks. Asked to comment on the poll, Dylan Avery said, "This poll confirms that the mainstream media has been brainwashing us to believe in 9/11 conspiracies, treating us all like 'sheeple.'" 9/11 Truthers praise Maher for "giving us the right drug for 9/11 Truth." Lines form at Ground Zero area drugstores. 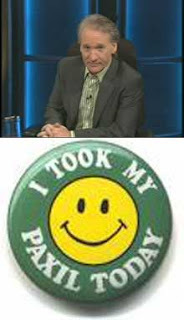 Bill Maher's announcement last night that 9/11 Truthers should "...start asking your doctor if Paxil is right for you," caused a sensation at New York City hospitals late last night and early this morning. "Suddenly, our ER started filling up with young, bedraggled twenty-somethings, all begging for prescriptions for Paxil," said, John Berliner, spokesperson for Bellevue Hospital. "They said it was unfair to keep them waiting for the "truth" till Monday when their own doctors' offices re-open - whatever the hell that means. We filled their prescriptions just to get rid of them." New Rule: Crazy people who still think the government brought down the Twin Towers in a controlled explosion have to stop pretending that I'm the one that's being naïve. How big a lunatic do you have to be to watch two giant airliners packed with jet fuel slam into buildings on live TV igniting a massive inferno that burned for two hours and then think, "Well, if you believe that was the cause?" Stop asking me to raise this ridiculous topic on this show and start asking your doctor if Paxil is right for you. Nico Haupt, spokesperson for the growing "no planer" faction of the 9/11 Truth Movement, said this was the sign he was waiting for. "Ve know dat drugs will show us die 9/11 truth. Ve just didn't know VICH drugs." According to medical literature, Paxil is effective in relieving anxiety and symptoms associated with Obsessive-Compulsive Disorder, long considered by psychologists to be the foundation of the 9/11 Truth Movement and other societal disorders. Ask to comment on the long line of 9/11 Truthers at his door, New York City pharmacist, Dirk Veersten, said, "Heh... whatever works to get them off the streets." "As much as it pains all of us in the 9/11 Truth Movement to face reality, we can no longer ignore that the vast majority of Americans, and even Osama bin Laden himself, believe 19 Arab cavemen were able to carry off the 9/11 attacks without help of the U.S. Government. "Despite the massive evidence we have collected showing that pre-planted explosives were needed to collapse the World Trade Center towers, Americans were unable to grasp the laws of physics sufficiently to see the truth. "Therefore, we have decided to abandon the reality that "9/11 was an inside job" in favor of the less elegant and less dramatic theory of LIHOP - that the Bush Administration let the attacks happen on purpose." "We ask all Truthers to return their "9/11 Was An Inside Job" T-shirts for disposal. 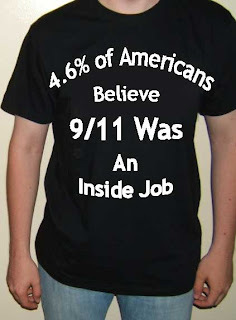 For those unwilling to abandon hope, Alex Jones has offered to modify the T-shirts to say "4.6% of Americans Believe 9/11 Was An Inside Job" for $12.95 plus shipping and handling. New York City and state residents, please add appropriate sales tax." Asked what would be done with the returned T-shirts, Avery said they "will be sent to China for recycling." For more information and shipping instructions please contact Dylan Avery at publicity@loosechange911.com or Alex Jones at prisonplanetweb@hotmail.com. Wanted: A Few Good Peer Reviewers. Shortage prompts training courses from Steven Jones. (BNN - June 17, 2007 - Salt Lake City, UT) - Steven Jones will soon address the continuing shortage of qualified peer reviewers plaguing the 9/11 Truth Movement with a series of two-day training courses in becoming a Certified Peer Reviewer. "My inability to find a single qualified peer reviewer prevents the full acceptance of my scientific papers as proof that 9/11 was an inside job," Jones announced on Friday. "Everyone I have submitted my papers to claims to be too busy. The shortage is felt throughout the 9/11 Truth Movement." 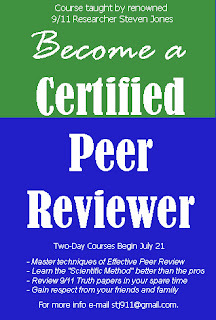 Starting on July 1, applicants may submit an application to Jones for courses leading to certification as a Certified Peer Reviewer (CPR). Courses will start on on Sat., July 21, and will begin every Saturday thereafter through October. Cost of the course is $125 and limited to 100 participants per course. Prospective students must have at least a high school diploma but there are no other eligibility requirements. An advertising and marketing campaign will start on June 18 in major markets. Jones believes he will have enough peer reviews by December 1 to blunt all critiques of his papers. "No one will be able to dismiss my scientific analysis anymore on the basis of not being peer reviewed. There will be enough qualified peer reviews to fill a box car." For full information and application form contact Steven Jones at stj911@gmail.com. Narcissism at Root of 9/11 Conspiracy Theories. 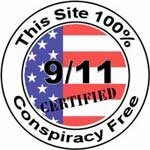 YouTube and blogs enhance self-importance of 9/11 Truthers - "ego inflation" behind instant expertise of 9/11 Truth Movement. (BNN - June 11, 2007 - San Diego, CA) - 9/11 conspiracy theorists believe that worldwide praise of their efforts proves they do not suffer from Narcissistic Personality Disorder or "ego inflation problems." Such is the reaction of leaders of the 9/11 Truth Movement to a recent study identifying an increase in narcissism in the younger generation. As first reported by the Screw Loose Change blog in March 2007, a new psychological study, Egos inflating over time," found that narcissism levels are significantly higher in recent generations." The study has spawned analysis of 9/11 conspiracy theorists, identifying narcissism as the prime motivating force behind efforts of young 9/11 Truthers to gain the attention they crave. "It is important to note that those in the 9/11 Truth Movement need to stand out in the crowd, to exert their 'rightful importance' in the world," says BNN health consultant, Dr. James T. Howard, Jr.
Narcissistic Personality Disorder (NPD) is characterized "...first and foremost by a positive and inflated view of the self, especially on agentic traits (e.g., power, importance, physical attractiveness... is associated with social extroversion, although narcissists have relatively little interest in forming warm, emotionally intimate bonds with others... involves a wide range of self-regulation efforts aimed at enhancing the self. These efforts can range from attention-seeking... taking credit from others... and opportunities to achieve public glory. Narcissists also lash out in aggression when they are rejected or insulted." 51% said that becoming famous was among their generation's important goals. Websites such as MySpace and YouTube (whose slogan is "Broadcast yourself") permit self-promotion far beyond that allowed by traditional media. An analysis of teenagers' MMPI responses showed that in the 1950s, only 12% agreed with the statement "I am an important person." By the late 1980s, 80% agreed. From the 1960s to the 1990s, agreement with California Psychological Inventory items such as "I have often met people who were supposed to be experts who were no better than I...have increased." Teenagers' MMPI responses showed that in the 1950s, only 12% agreed with the statement "I am an important person." By the late 1980s, 80% agreed. Illustrations of narcissism among the young generation of 9/11 conspiracy theorists include the famous debate in September, 2006, between "Loose Change" creators Dylan Avery and Jason Bermas and authors of the Popular Mechanics's stellar debunking of 9/11 conspiracy theories. Unable to withstand the rational rejection of his 9/11 conspiracy theories, Jason Bermas became increasingly arrogant and haughty believing himself to be a far better expert on structural engineering, physics, chemistry, and forensic science than the hundreds of experts that made up the NIST investigation. As the grandiose sense of his own abilities was crushed, Bermas repeatedly called the authors of "Debunking 9/11 Myths" liars. Dr. Howard has followed 9/11 conspiracy theorists for four years, noting the case of William Rodriguez, the respected hero of 9/11, who led dozens of people to safety from the north tower of the World Trade Center before it collapsed on Sept. 11, 2001. Lately, many in some quarters have described Rodriguez as the "Fallen Angel" of 9/11. "Fantasies about having exceptional power, attractiveness or success, a sense of belonging to an exclusive group of people who truly understand each other, expectations of special treatment, and haughty or arrogant behavior are some of the things we've seen in 9/11 conspiracy theorists." "Many accused me of exploiting 9/11. I am 9/11!" "I was there, I experience the event, I lost 200 friends, I formed a 9/11 victims group, went to congress to fight for them, part of many organizations dealing with the blueprint to avoid future emergencies, speak on the media all the time on different issues related to 9/11, pushing a senate hearing in June to deal with the First Responders issue and live it every day of my life, any doubts?" The "Egos inflating over time" study concludes that, "Self-correction may occur, however, given a strong enough external force... if another Great Depression or world war struck, Americans might suddenly have to temper their narcissism." Dylan Avery Accuses NOAA, CIA of Spawning Iran-Bound Cyclone Gonu. Singlehandedly uncovers plot to raise oil prices, attack Iran. (BNN - June 6, 2007 - Dubai, United Arab Emirates) - During a fund raising stop in Dubai on Wednesday, Dylan Avery accused the National Oceanic & Atmospheric Administration and the CIA of spawning Cyclone Gunu in a plot to disrupt Gulf oil shipments and cause destruction to Iran. 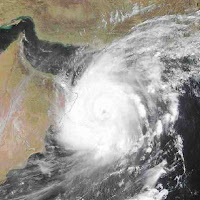 "'Gonu is moving in the expected direction and its center will be shifted from the Strait of Hormuz to the Iranian coast beginning this evening,' said Dr. Saad Al-Mehlafi, director general of the National Observation Center of Saudi Arabia’s Presidency for Meteorology and Environment (PME)." "There has never been a cyclone in this part of the world," Avery said. "It is physically impossible as confirmed by David Ray Griffin. No one but NOAA with the CIA's chemtrail experience could pull off something on this scale. The Bush administration and oil companies will profit and hurt Iran in one climate attack. Global warming pales in comparison." Arab News reports that "oil prices rose amid forecasts that the strongest storm to threaten the Arabian Peninsula in 60 years was barreling toward Iran." Dylan Avery is traveling throughout the Arabian Peninsula seeking funds to finance his faltering third effort to change "the hearts and minds of the world's citizens" to accept 9/11 Truth. 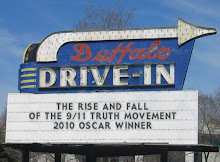 The third revision of his film, "Loose Change," to correct staggering errors in fact and present a coherent, factual account of the 9/11 attacks, has run into "far more contradictions than we expected", Avery said. Postponed for release until September, the third edition is titled, "Loose Change: The Final Solution." Any resemblance to any person or entity, living, dead, or imagined, is not a coincidence. Coincidences do not exist. The Truth about September 11 Exposed!